Good things come to those who wait and so came along the blissful beaches of Kovalam. This was second last stop of our itinerary. 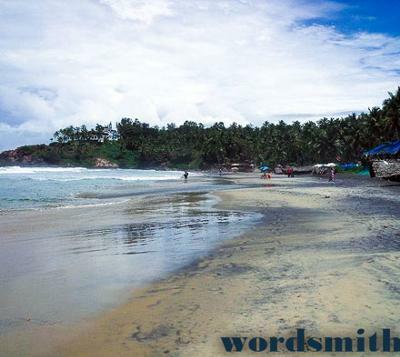 On reaching Kovalam I discovered that there were at least three awesome beaches to Kovalam. But before that we had a really adventurous drive from Alleppy on our rented bikes. On this drive we came across long stretches of road through thick vegetations of coffee and coconut plantations. On arrival at one of our tea-break stops at a roadside restaurant we were served with a red coloured warm drink. We thought it to be some kind of local toddy but were surprised to find out that it was “chukkuvellam” the boiled medicated drinking water that is a trademark of the state. I so much loved it for its soothing effect on my throat that on my way out I bought a packet of these herbs to be used back home. 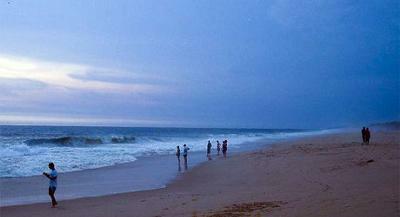 Lighthouse beach is very popular among all the tourists that flock to Kovalam. The beach is quite clean given the high traffic it accommodates. 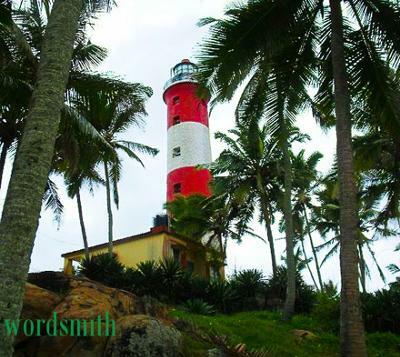 It has a 35 meter high lighthouse towering over the Kurumkal hillock that gives the beach its name. It also has shallow waters ideal for swimming and dark sands for lying around. The visiting hours to the lighthouse are between 4pm and 6pm and the topmost point provides a bird’s eye view of the scenic surroundings. Beautiful villas and private hotels line up along the beach. The local market that we visited during the evenings offer the regular stuff and I did not find anything special about it. However the shops those dot the entry to the beaches display a lot of fancy souvenirs. In one such shop I bought a plastic bottle containing all sorts of dried herbs. This bottle was supposed to be filled with our regular coconut oil and kept aside for a month. The herbs would then turn the oil to amber red indicating it was ready to be applied to the scalp and arrest hair fall. In these shops I also spotted idols of mythological figures placed in coconut shells with a small electrical bulb to illuminate the inside. The following day we ventured into the ocean in a traditional Catamaran at Kovalam’s main beach. These ancient boats are rowed with a bamboo paddle and maneuvered by experienced local fishermen. However if you suffer from seasickness then it’s advisable to avoid this ride since the boat often rocks unevenly. But the experience is worth the money and time. Our ride lasted around 20 minutes and cost us 500 INR for two people. Later we also learned that one can go snorkeling from the boat early morning. If you wish to be more romantic then opt for the “sunset cruises”. Mid size boats with decent interiors take you inside the ocean depending upon the tide. No advance booking is required for this and they operate on ‘first come – first served’ basis. Poovar beach is comparatively a quieter place and can be reached by a boat ride on the backwaters here. To reach the backwaters we had to drive on road for almost half an hour from the main beach. Poovar, a small island, separates the sea from the Neyyar river. The idyllic location that this beach is, very few tourists actually take trouble to take a detour and come here. That is the reason for its virginal beauty. As soon as I stepped on the pristine beach of Poovar, I felt like entering a world stopped in its tracks a few decades ago. This fishing village with a rich legacy of a brave king is home to abundant flora, a good variety of spices (available in the local market) and coconut and banana groves. Compelled due to our itinerary we withdrew from this paradise and set off on our journey back to Kovalam city. Back in Kovalam I treated myself to a refreshing Ayurveda massage at my hotel done with natural oils and herbs. At 6000INR it cost me a bomb, but I have nothing to complain as I discovered a lighter me sans all worries and fears. They also advised me a diet regime, which I was not able to adhere to for a long time. Kovalam offers a choice of good eateries near its beaches with vegetarian and non-vegetarian foods at modest prices. We had our dinner at one of these restaurants and went for a stroll on the beach though it was not encouraged by our hotel staff due to the rough appearance of the sea. 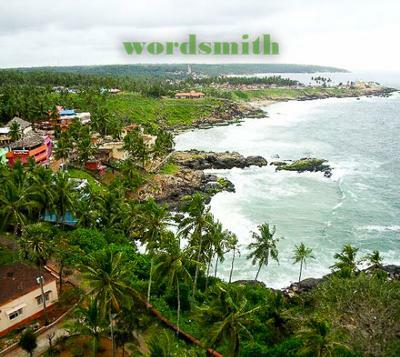 Kovalam-the heaven in Kerala was a perfect spot to wrap up our lovely trip to Kerala. Now Kanyakumari our final destination was beckoning us with its serene and imposing memorial of Swami Vivekananda.